On Saturday 23rd and Sunday 24th May, Devon's newest wedding and exclusive party venue will be opening it's doors for you to take a peak inside the home of Lord Ivar Mountbatten. Bridwell, in association of Blue Fizz Events, invite you to join a selection of handpicked wedding suppliers for live music, product demonstrations and outdoor fun whilst capturing your heart and offering venue inspiration. Tickets are £5.00 per person (little people free) and the first 100 brides who attend each day will receive an exclusive hand tied gift. You can book online here or just turn up on the day and everyone will receive a complimentary glass of bubbly & miniature Devon cream tea. 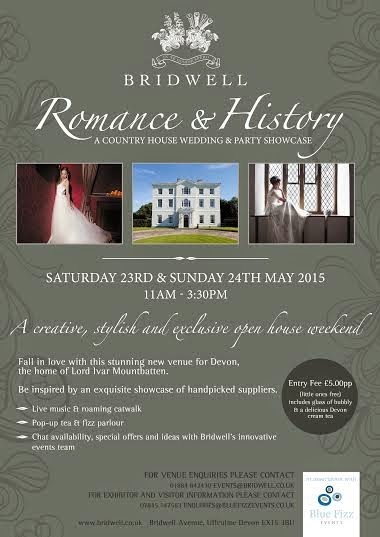 For more information or to receive a brochure, please contact the Events team on 01884 842430 or email events@bridwell.co.uk .